Mikko Hermanni Hyppönen (Finnish pronunciation: ['mik:o 'hyp:ønen]; born October 13, 1969 in Finland) is a computer security expert and columnist. Mikko Hyppönen is Chief Research Officer at F-Secure. He has worked at F-Secure in Finland since 1991. Hyppönen has assisted law enforcement in the United States, Europe and Asia since the 1990s on cybercrime cases and advises governments on cyber crime. His team took down the Sobig.F botnet. In 2004, Hyppönen cooperated with Vanity Fair on a feature, The Code Warrior, which examined his role in the Blaster and Sobig Computer worms. Hyppönen has given keynotes and presentations at a number of conferences around the world, including Black Hat, DEF CON, DLD, and RSA. In addition to data security events, Hyppönen has delivered talks at general-interest events, such as TED, TEDx, DLD, SXSW and Google Zeitgeist. He's also spoken at various military events, including AFCEA events and the NATO CCD COE's ICCC. Hyppönen is a reserve officer in the Finnish Army. Hyppönen is a member of the advisory board of IMPACT (International Multilateral Partnership Against Cyber Threats) since 2007 together with Yevgeny Kaspersky, Hamadoun Touré, Fred Piper and John Thompson. Hyppönen is a columnist for BetaNews and Wired. He has also written on his research for CNN, The New York Times and Scientific American. In 2011, he was ranked 61st in Foreign Policy's Top 100 Global Thinkers report. The two greatest tools of our time have been turned into government surveillance tools. I'm talking about the mobile phone and the internet. George Orwell was an optimist. Hyppönen made international news in 2011 when he tracked down and visited the authors of the first PC virus in history, Brain.A. Hyppönen produced a documentary of the event. The documentary was published on YouTube. Hyppönen has also been documenting the rise of mobile phone malware since the first smartphone viruses were found. The blog "News from the Lab", started by Hyppönen in 2004 was the first blog from any antivirus company. Hyppönen has been credited by Twitter for improving Twitter's security. Mr. Hyppönen has been the Curator for the Malware Museum at The Internet Archive since 2016. ↑ Helen Martin (November 2010). "Conference report, Vancouver expedition" (PDF). pp. 6–7. Retrieved 2012-08-06. ↑ "The FP Top 100 Global Thinkers". ↑ "50 Most Important People on the Web". March 5, 2007. ↑ "Mikko Hypponen background at TEDxRotterdam". ↑ Shnayerson, Michael (January 2004). "The Code Warrior". Vanity Fair. Retrieved 2013-09-13. 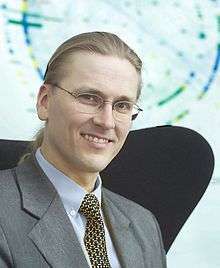 ↑ "Mikko Hypponen: Behind Enemy Lines (Hack In The Box Security Conference 2012)". ↑ "The Finnish Defence Forces Annual Report 2010" (PDF). ↑ "List of the members of the advisory board of IMPACT". ↑ "Wired Columns by Mikko Hypponen". 2012-06-01. ↑ Mikko Hyppönnen (2012-06-05). "A Pandora's Box We Will Regret Opening". ↑ "Articles by Mikko Hyppönen". Scientific American. ↑ Foreign Policy. The FP Top 100 Global Thinkers. December 2011. ↑ "USA Today – Documentary examines the inception of PC viruses 25 years ago". 2011-03-08. ↑ "Fighting viruses, defending the net". TED. ↑ "YoutTube – Brain: Searching for the first PC virus in Pakistan". ↑ "Scientific American – Malware Goes Mobile" (PDF). ↑ "Twitter Security – The following people have helped us keep Twitter safe for everyone. We very much appreciate their efforts.". Archived from the original on 2014-07-10. Wikimedia Commons has media related to Mikko Hyppönen.